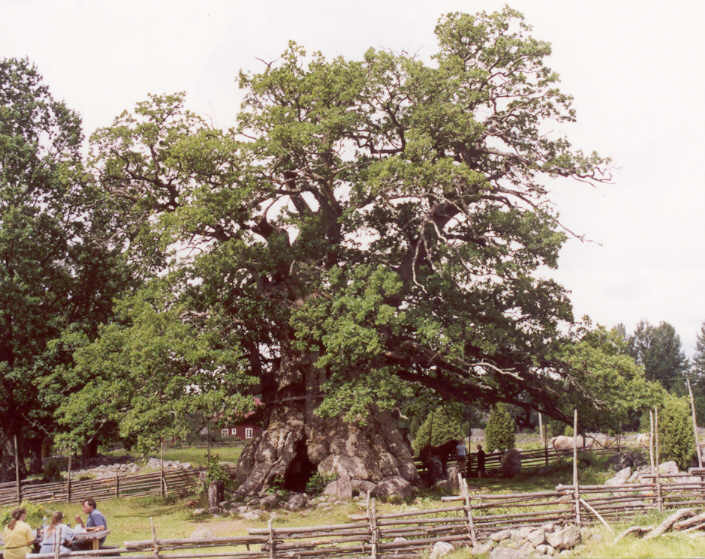 The Kvill-eken ( Oak of Kvill) in Rumskulla, near Vimmerby, South-East Sweden. Probably the oak with the largest girth at breastheight of Europe, at least since the huge Emperors-oak in Bosnia, former Yugoslavia ( wich had a girth of over 16 m - 53 feet) , died a few years ago. 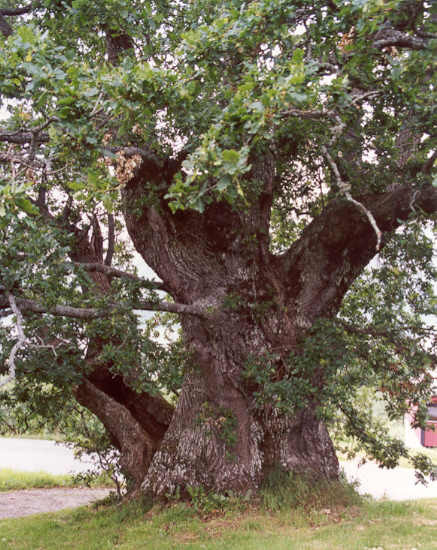 The Kvill-oak has a hollow trunk with a circumference of 14,2 m ( 47 feet). Its age is estimated to be between 800 and 1000 years. 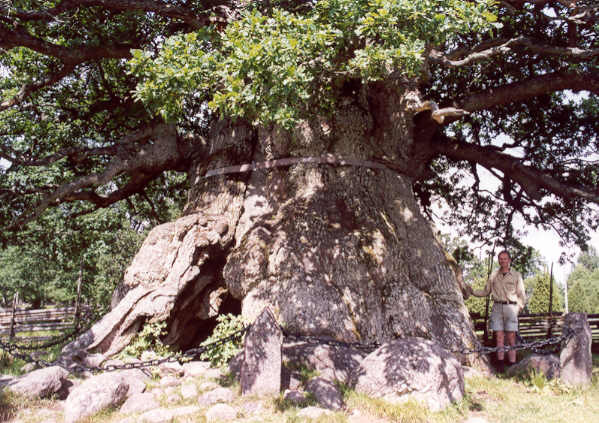 Although Sweden has a rather cool climate and poor, acid soils, it is not strange that it has the biggest girthed oak of Europe. Oaks do not grow very quick nor tall here, but they become not less old: it is thought even that they grow oldest on the poorer soils. Besides, Southern Sweden has a long tradition of open grazed forests with scattered oaks. This tradition here has lasted longer than in England or Germany and especially in South-eastern Sweden some good areas have been preserved. There still many ancient oaks can be found, severall of them with girths between 9 and 11 m ( 30 to 36 feet). A good example is the forest-reserve Halltorps-Hage on the isle of �land. More old oaks in Sweden can be seen at Jeroen Paters website on old trees. 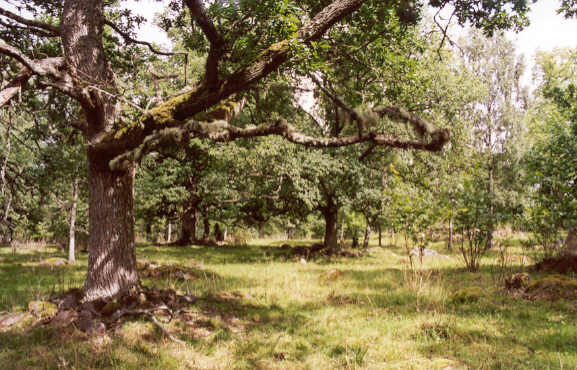 A grazed forest near the Kvill-oak, remnant of the ancient landscape described above. Unexpected and rather hard to be found, along the great Hardanger Fjord , near Ullensvang, Norway, stands this big hollow oak called the Brureik ( Brur-oak), being one of the biggest Norwegian trees with its 10 m (33 feet) girth . Because of the mild climate near the Norwegian Coast here grow the most northerly oaks of Europe. There are some more of these big old oaks along the Fjords, the most northern one even along the Sogne Fjord. Pictures of some of them can be seen at Jeroen Pater's website on old trees.